Welcome to Holiday Cottages – Scotland. We specialise in helping you compare as many Scottish holiday cottage properties as possible. With cottages coming in all shapes and sizes, sleeping 2 to 16 and located all over Scotland we hope that you will be able to find the perfect self catering holiday cottage at a location that meets your needs. We are independent, so offer cottages through a number of holiday letting companies as well as directly with the cottage owner. With many cottages located near beautiful Scottish Lochs it can be the perfect way to experience an idyllic location for your holiday. You are not just limited to village locations as there are cottages in coastal locations and some have fantastic views over the sea as well as a perfect viewing point for the wildlife that lives on the coast. 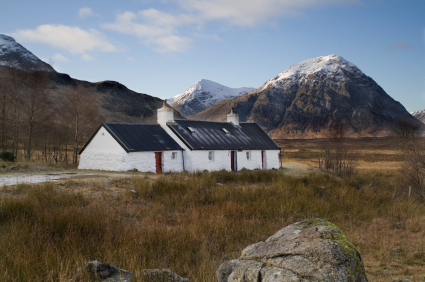 If complete solitude is your idea of a relaxing break then there are cottages located in the middle of the beautiful, unspoiled Scottish higlands. If a town or city is more your thing then there are plenty of self catering holiday properties located in lively cities and towns.